The Donnan equilibrium hypothesis required that the muscle membrane should be completely impermeable to sodium. When the radioactive isotope 24Na became available, this was soon found not to be so, for about half of the intracellular sodium in the fibres of a frog's sartorius muscle turned out to be exchanged with the sodium in the external medium in the course of one hour. Moreover, experiments on giant axons from squid and cuttlefish showed that after dissection there was a steady gain of sodium and loss of potassium that if not counteracted would eventually have led to an equalization of the sodium and potassium contents of the axoplasm. It became clear that in actuality the resting cell membrane does have a finite permeability of Na+ ions, but that the inward leakage of sodium is offset by the operation of a sodium pump which extrudes sodium at a rate which ensures that in the living animal [Na] is kept roughly constant. 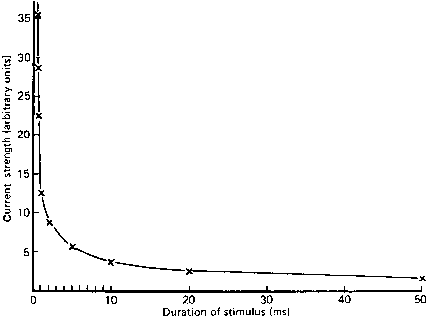 As far as sodium and potassium are concerned, the resulting situation should be described as a steady state rather than an equilibrium, though for experiments like those carried out by Boyle and Conway the effect is the same. Since the expulsion of Na+ ions from the cell takes place against both an electrical gradient and a concentration gradient, it involves the performance of electrochemical work and requires a supply of energy from cell metabolism. The process is therefore termed active transport. Fig. 3.6. The effect on sodium efflux of blocking metabolism in a Sepia (cuttlefish) axon with dinitrophenol. At the beginning and end of the experiment the axon was in unpoisoned artificial sea water. Temperature 18°C. From Hodgkin and Keynes (1955a). Fig. 3.7. The rate of loss of radioactivity from a 780 ¡im squid axon loaded by micro-injection with 6700 counts/min of 22Na, distributed over 12 mm. 32 nanomoles of ATP were injected over the same 12 mm. Temperature 19°C. From Caldwell and Keynes (1957). the internal radioactivity by inactive sodium entering the axon as the experiment proceeds. When, however, the metabolic inhibitor 2,4-dinitrophenol (DNP) was added to the external medium, the counting rate fell quickly to about one thirtieth of its previous level. The effect was reversible, and on washing away the DNP the efflux soon recovered. Axons treated with cyanide or azide behaved in a similar fashion. Since all these inhibitors are known to act by blocking the production of the energy-rich compound adenosine triphosphate (ATP) by oxidative phosphorylation in the mitochondria, the implication was that the sodium pump was driven by energy derived from the terminal phosphate bond of ATP. The role of ATP as the immediate source of energy for sodium extrusion was further examined by testing its ability to restore the sodium efflux when injected into cyanide-poisoned axons. Fig. 3.7 shows that ATP injection did bring about some degree of recovery of the efflux, but it turned out that a complete recovery was only obtained if the ratio of [ATP] to [ADP] in the axoplasm was made reasonably large. This could be achieved by the injection of arginine phosphate, which serves as a reservoir for high energy phosphate in the tissues of invertebrates through the reaction. ADP + arginine phosphate = ATP + arginine. Fig. 3.8. The effect on the efflux of labelled sodium from a squid giant axon of first blocking metabolism with cyanide and then injecting a large quantity of arginine phosphate. Open circles show efflux with [K]o = 10 mM; filled circles show efflux into a potassium-free solution. 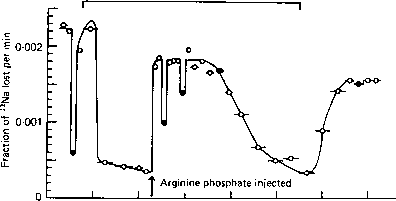 Immediately after the injection the mean internal concentration of arginine phosphate was 33 mM. Temperature 18°C. From Caldwell, Hodgkin, Keynes and Shaw (1960). 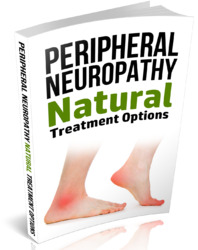 non-myelinated nerve fibres is thought to arise in this way from an acceleration of the sodium pump, and the pumping of ions in many other situations has now been shown to be electrogenic to some degree. The sodium pump occurs universally in the cells of higher animals, and can be identified with the enzyme system Na,K-ATPase first extracted from crab nerve by Skou. Research on the chemistry of Na,K-ATPase has depended heavily on the exploitation of the inhibitory action of glycosides like ouabain and digoxin, which in micromolar concentrations block both the active fluxes of sodium and potassium in intact tissues, and the splitting of ATP by purified enzyme preparations. By measuring the binding of ouabain labelled with tritium, it is possible to estimate the number of sodium pumping sites in unit area of membrane, assuming that each site binds one molecule of ouabain. In the squid giant axon there are several thousand sites per fxm2 of membrane, while in the smallest non-myelinated fibres the density of sites is about a tenth as great. Fig. 3.9. The lack of effect of dinitrophenol on the sodium entry during stimulation of a squid axon. 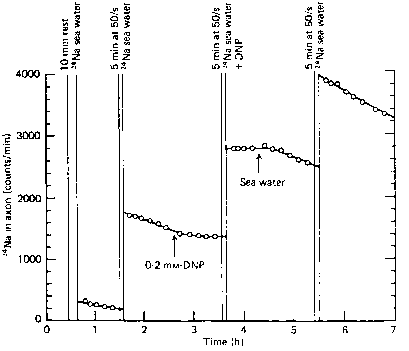 The resting sodium influx for the first period of immersion in 24Na sea water was 50 pmole/cm2. Temperature 17°C. From Hodgkin and Keynes (1955a). sodium influx into a squid giant axon was measured by soaking it for a few minutes in a solution containing 24Na and then mounting it above a Geiger counter in a stream of unlabelled artificial sea water. While sodium was being actively extruded from the axon, the counting rate fell steadily, but on the addition of DNP to the sea water bathing the axon, the counts remained constant. When the DNP was washed away, the sodium pump started up again. The rate of gain of radioactivity during the periods of exposure to 24Na was increased by a factor of about 10 by stimulation at 50 shock/s, but the extra entry of 24Na was the same whether or not the sodium pump had been blocked. 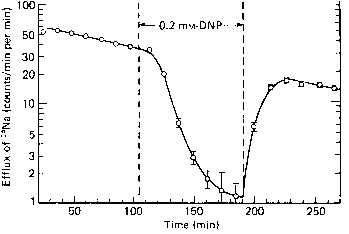 Washing out experiments showed that the accelerated outward movement of 24Na during the impulse (see p. 45) was affected equally little by DNP. Fig. 3.10. There are two types of ion channel traversing the nerve membrane. The sodium pump responsible for transporting ions uphill and so creating the concentration gradients is shown as a bucket system driven by ATP. The sodium and potassium channels involved in excitation are shown as funnel-shaped structures whose opening is controlled by the electric field across the membrane. In this diagram they are in the resting state with the charged gates held closed by the membrane potential. On depolarization of the membrane the gates open and permit ions to flow downhill. independently of one another. This can be demonstrated most clearly in giant axons because of their large volume to surface ratio. 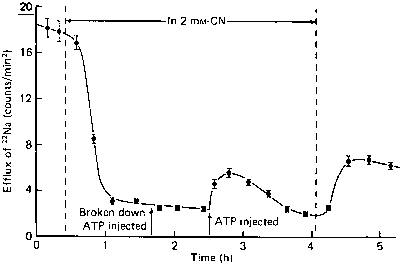 Perhaps the most striking example of the independence of the pump and spike mechanisms was provided by Baker, Hodgkin and Shaw when they showed that a squid axon whose axoplasm had been extruded and replaced by a pure solution of potassium sulphate was nevertheless capable of conducting over 400000 impulses before becoming exhausted. In a small non-myelinated nerve fibre the downhill ionic movements during the nervous impulse are much larger in relation to the reservoir of ions built up by the sodium pump, so that blockage of active transport does, after a relatively short while, affect the conduction mechanism indirectly by reducing the size of the ionic concentration gradients. What does replacing sodium ion with cynaide bring about in a resting potential ?